Yesterday, November 22, 2015, marked the 52nd anniversary of the assassination of President John F. Kennedy in Dallas, Texas. President Kennedy was fatally killed by Lee Harvey Oswald in 1963 as he was being driven in a four door Lincoln Continental convertible. Oswald shot President Kennedy from the sixth floor of the Texas School Book Depository. Oswald would later be murdered himself by Jack Ruby, a Dallas nightclub owner. President Kennedy was with his wife, First Lady Jacqueline Kennedy, Governor John Connally of Texas, and his wife, First Lady Nellie Connally. Secret Serivce Agent Clint Hill was in the car behind the presidential limousine when the shooting began. After hearing one shot Agent Hill ran to save the President. Mrs. Kennedy then climbed out onto the back of the presidential limousine to retrieve part of President Kennedy’s skull. The presidential limousine left Dealey Plaza and went straight to Parkland Memorial Hospital. Governor Connally was wounded but later survived. President Kennedy could not be saved and was pronounced dead at 1:00 P.M. A Roman Catholic priest administered the last rites to the President shortly before his passing. Vice President Lyndon Johnson would later take the oath of office as the 36th President of the United States aboard Air Force One. 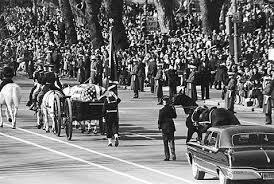 President Kennedy’s state funeral took place three days after his assassination on November 25, 1963. He was placed in the East Room of the White House for 24 hours. He was later brought to the U.S. Capitol to lie in state. After the Requiem Mass at St. Matthew’s Cathedral in Washington D.C., President Kennedy was laid to rest at Arlington National Ceremony in Virginia. An eternal flame is present to memorialize the President and his great life. President Kennedy left behind his wife, his son John F. Kennedy Jr., and daughter Caroline along with many who loved and admired him. 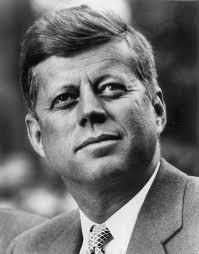 Mrs. Kennedy passed away in 1994 and is presently buried alongside her husband. Close by are the President’s late brothers, former U.S. Attorney General Robert Francis Kennedy, and former Senator of the State of Massachusetts Edward Moore Kennedy. President Kennedy’s son would later die in a tragic air plane crash in 1999 and his daughter Caroline is the current U.S. Ambassador to Japan. President Kennedy was the youngest man ever elected president and the first and only Roman Catholic to be elected president.